PASCAGOULA, Miss., Aug. 30, 2012 (GLOBE NEWSWIRE) -- The amphibious transport dock Arlington (LPD 24), the eighth built at Huntington Ingalls Industries (NYSE:HII), recently returned from successful builder's sea trials in the Gulf of Mexico. Dock trials started last week, and the ship left HII's Ingalls Shipbuilding division on Aug. 21 for three days of at-sea testing. "Our shipbuilding team worked diligently to get this ship ready for sea," said Doug Lounsberry, Ingalls' vice president and program manager, LPD 17 Program. "The LPD team will continue to work just as hard getting Arlington ready for her acceptance trial in October. LPD 24 proved her seaworthiness with strong performance in several different tests, including the ship's propulsion, steering, navigation, communications and weapons. The folks on board did an outstanding job in operating this entire sea trial. I applaud each and every one of them." As with every ship built at Ingalls, a test and trials team thoroughly tested LPD 24's major operational systems. More than 200 test events took place during the sea trials, including anchor handling, flight operations, ballasting and de-ballasting the well deck, and compartment air balancing. "The logistics it takes to conduct that many test events in a three-day period requires excellent planning by the test and trials team," said Richard Schenk, Ingalls' vice president of test and trials. "The team and the ship performed well. While there is still much work to do in preparation for U.S. Navy acceptance trials, I'm confident the LPD 24 HII/Navy team will have the ship ready. It is incumbent upon us to ensure the safety of every sailor and Marine who will operate this amphibious ship. We do not take that responsibility lightly, and these sea trials prove it." The ship will now prepare for acceptance sea trials to demonstrate the same tests and operational success to the U.S. Navy's Board of Inspection and Survey (INSURV). The ship is scheduled to be delivered to the Navy this year. 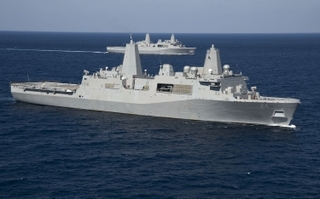 Ingalls has delivered six ships in the class and has five more in various stages of construction, including LPD 24. 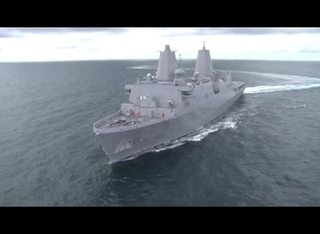 The LPD 17-class ships are 684 feet long and 105 feet wide and displace approximately 25,000 tons. Their principal mission is to deploy the combat and support elements of Marine Expeditionary Units and Brigades. The ships can carry up to 800 troops and have the capability of transporting and debarking air cushion (LCAC) or conventional landing crafts, augmented by helicopters or vertical take-off and landing aircraft such as the MV-22. The ships will support amphibious assault, special operations or expeditionary warfare missions through the first half of the 21st century.